We make digital marketing easy to understand and use. Making digital marketing easy to understand and use has always been the mission driving Dealer Teamwork. Having the best customer service in the automotive industry is critical to fulfilling that mission. For that reason, Dealer Teamwork is pleased to announce the addition of Lani Almen as Client Services Director. Like another recent addition to the client services team, Jennifer Beckman, Lani comes to Dealer Teamwork after a long career in the automotive industry. She has spent 17 years on the dealership side of the industry, working for several influential dealer groups in Minnesota including Walser and Apple Autos. For the last six years, she worked as a BDC Manager and Sales Manager. 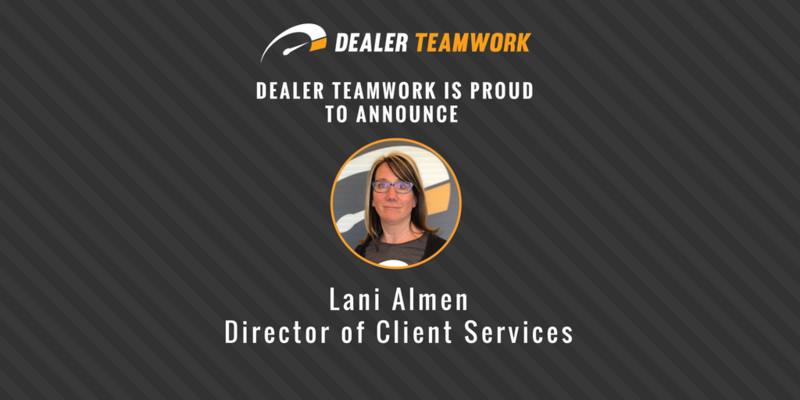 Throughout her career, Lani has found immense satisfaction from serving her clients while mentoring other automotive professionals to help them advance their own careers – goals she hopes to continue while at Dealer Teamwork. You’re going to love what the MPOP® does for you! See how the MPOP® can help you!